Robin Youngs, Edward Fisher,	The Journal of Laryngology & Otology, Volume 127 Issue 3, p 221. A Farboud, R Crunkhorn, A Trinidade,	The Journal of Laryngology & Otology, Volume 127 Issue 3, pp 222-226. S Bathala, R Eccles,	The Journal of Laryngology & Otology, Volume 127 Issue 3, pp 227-232. A J Hope, L M Luxon, D-E Bamiou,	The Journal of Laryngology & Otology, Volume 127 Issue 3, pp 233-238. J Li, L Yu, R Xia, F Gao, W Luo, Y Jing,	The Journal of Laryngology & Otology, Volume 127 Issue 3, pp 239-245. P M Spielmann, S McKean, R D White, S S M Hussain,	The Journal of Laryngology & Otology, Volume 127 Issue 3, pp 246-251. V Akdogan, I Yilmaz, T Canpolat, L N Ozluoglu,	The Journal of Laryngology & Otology, Volume 127 Issue 3, pp 252-259. Sh Maleki, S K Kamrava, D Sharifi, M Jalessi, A Asghari, S Ghalehbaghi, P Yazdanifard,	The Journal of Laryngology & Otology, Volume 127 Issue 3, pp 260-264. J Suzuki, T Oshima, K Watanabe, H Suzuki, T Kobayashi, S Hashimoto,	The Journal of Laryngology & Otology, Volume 127 Issue 3, pp 265-270. M Farhadi, H Ghanbari, F Izadi, E Amintehran, M S Eikani, Y Ghavami,	The Journal of Laryngology & Otology, Volume 127 Issue 3, pp 271-273. R Gupta, A K Gupta,	The Journal of Laryngology & Otology, Volume 127 Issue 3, pp 274-278. J Goswamy, S E Penney, I A Bruce, M P Rothera,	The Journal of Laryngology & Otology, Volume 127 Issue 3, pp 279-284. L A Joseph, J A Routledge, M P Burns, R Swindell, A J Sykes, N J Slevin, S E Davidson,	The Journal of Laryngology & Otology, Volume 127 Issue 3, pp 285-294. Y Bajaj, K Kapoor, S Ifeacho, C G Jephson, D M Albert, J I Harper, B E Hartley,	The Journal of Laryngology & Otology, Volume 127 Issue 3, pp 295-298. B Abboud, J Tannoury, G Sleilaty, R Daher, G Abadjian, C Ghorra,	The Journal of Laryngology & Otology, Volume 127 Issue 3, pp 299-302. M I Syed, M Madurska, B F O'Reilly,	The Journal of Laryngology & Otology, Volume 127 Issue 3, pp 303-305. S B Minami, H Takegoshi, Y Shinjo, K Kaga,	The Journal of Laryngology & Otology, Volume 127 Issue 3, pp 306-310. C Martens, A Csillag, M Davies, P Fagan,	The Journal of Laryngology & Otology, Volume 127 Issue 3, pp 311-313. J Byun, DS Massi, A Sehgal, M Saadia-Redleaf,	The Journal of Laryngology & Otology, Volume 127 Issue 3, pp 314-317. Z W Liu, A Walden, C A Lee,	The Journal of Laryngology & Otology, Volume 127 Issue 3, pp 318-320. T A van Essen, J B van Rijswijk,	The Journal of Laryngology & Otology, Volume 127 Issue 3, pp 321-322. 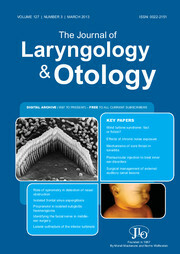 B C Hanna, N Bailie, G Gallagher, J Cole,	The Journal of Laryngology & Otology, Volume 127 Issue 3, pp 323-328.